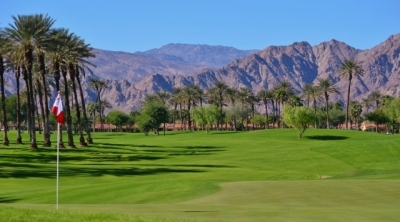 LA QUINTA, CA – It’s often been said that no one should be in a hurry to finish a round of golf, but reality in the 21st century sometimes dictates that we squeeze in a game around a multitude of life’s pressing circumstances. 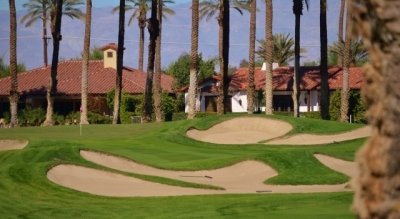 If you’re the type of person who needs to get-in and get-out, then The Palms Golf Club in La Quinta, California (right next to the Weiskopf and Nicklaus Resort Courses at PGA West) just might be the place for you. 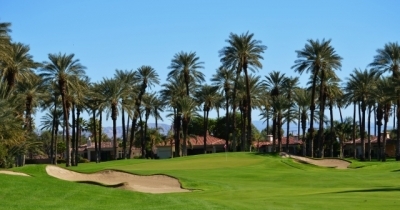 The private Palms Club is set on 150 acres of nearly flat desert floor, and with all of the greens conveniently situated close to the next hole’s tees, The Palms is truly built for speed. There is a beautiful mountain backdrop to the par three 2nd hole. But that doesn’t mean the Palms is only good for a quick game. Far from it. The club is home to a multitude of Tour players and others who want the type of atmosphere where golf tops the priority list. In other words, the concept at the Palms was different than most private clubs – especially in the Coachella Valley/Palm Springs area, where there are dozens of high-end private clubs and public tracks, with the vast majority built as amenities for housing developments or resorts. The 475-yard, par four 10th hole is the first of several strong par fours on the back nine. Not the Palms. While there are homes lining the perimeters of a few holes, it’s essentially a “core” golf course in every sense of the term. Again, it’s just pure golf. The course was designed by golf legend Fred Couples along with Brian Curley, who tutored under Pete Dye (Landmark Golf) on such projects as Kiawah Island and close by on the PGA West Stadium Course. The designers had all the tools to turn the Palms (which opened in late December of 1999) into something special. Unfortunately for the architects, if they were going to create a course with a lot of distinction, the land itself wouldn’t offer much help. One part of the property was previously a date farm and the other a ranch farm – both portions with very little (if any) topographical variation. The par four 9th hole finishes right in front of the Palms clubhouse. 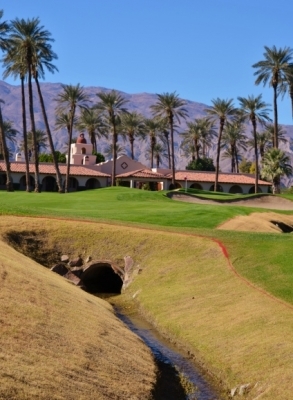 “The best part of the property was the huge grid pattern of date palm trees… but this was also the worst part in that every hole could end up looking the same. Luckily there was also a nice section (where the first six holes are located today) that weaved through an area of sandy dunes with wild shrub vegetation,” Curley remembered. 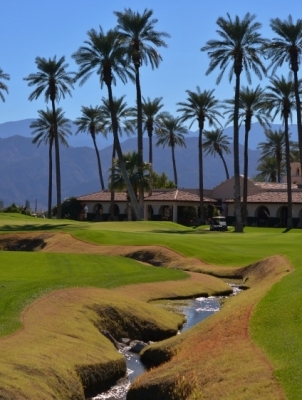 In that sense, the Palms really is unique with a couple distinct looks within the same golf course – especially on the front nine. The course starts out with the sandy dune/scrub vegetation motif and works its way into the more wide-open, palm lined holes that the club is famous for. Near the green on the long par five 14th hole. The hole is hard enough as it is -- stay out of the bunkers. The water features at the Palm are different from what you see at most courses in the desert, too. Both the bunker and the desert shrubs are placed well in front of the par three 5th hole -- but they look really close to the green. Again, the Palms is built for speed. You can hit your ball into one of the streams and still get it out rather quickly, too (we can vouch for that). As far as the different aesthetic looks on the course, that was part of the plan as well. Ebersberger says the Palms has touches of Augusta, Riviera, Oakmont, Royal Melbourne and Pinehurst. That’s quite a line-up of quality golf, and the greens complexes and large sculpted bunkers provide a sampling of all of those legendary golf layouts. 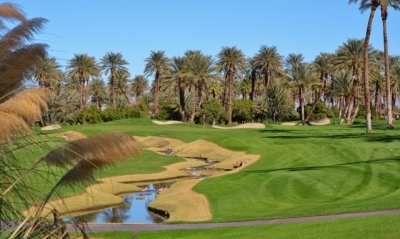 The short game is essential at every course, but especially so at the Palms. There is a large grove of palms in back of the par three 15th hole. Boom it off the tee, but putt it to win the hole – makes for a very entertaining golf course. 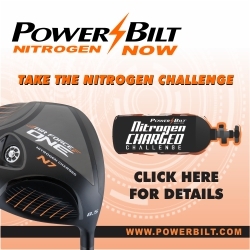 “We wanted the players to be able to hit driver on every hole if they choose,” Ebersberger added. But even with the very generous fairways, the sheer number of doglegs on the course requires you to shape your drives. Being on the correct side of the hole makes a big difference on the second shots. 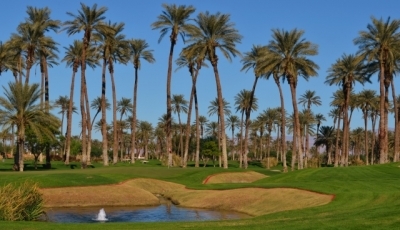 Yet another unique aspect of the Palms is its Par 70 scorecard – something you might see at the U.S. Open, but not too often for amateurs who like par fives. Curley said the par scheme was something they incorporated into the layout to offer the chance for members to play as much – or as little – as they want during a visit. Any shot left short on the approach to the par five 6th hole could roll back into the stream. The Palms’ front nine is quite a bit shorter than the back, giving the club another type of split personality. The par 34 outward nine has three par threes and only one par five. In contrast, the inward nine measures over 3800 yards from the back tees – no wonder the pros don’t get bored. The staff recommended that we play the blue tees on the front nine and the white tees on the back – which made for a very comfortable combination, though if we played again, we’d probably opt to keep it more consistent. 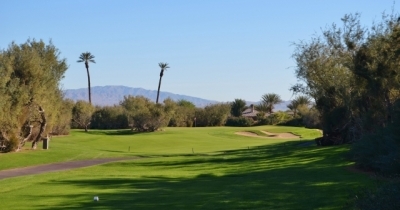 From behind the 12th green, you appreciate the beauty and serenity of a desert core golf course. Seeing the course, you can easily understand why it’s popular with better players and higher handicaps as well. Both Curley and Fred Couples have seen just about every type of course out there, and sought to make it fun for everyone. Highlights on the course include the par four fourth hole, which is probably the narrowest on the entire layout. It certainly is intimidating off the tee, with out-of-bounds on the right and desert scrub to the left – not good news if you miss on either extreme. From the back sets of tees it looks like there’s very little playing area, but the fairway is wide enough if you don’t let the views get to you. The par four ninth hole finishes with the Palms’ clubhouse as the backdrop – but you’ll have to navigate the challenging dogleg right to get there first. There’s all the room in the world to hang it out left off the tee, but then you’ll leave a virtually unmanageable second shot. Cut off as much of the dogleg as you dare – and you’ll have to work around one of those streams, too. The par five fourteenth stretches out to 631-yards from the back tees, and seems like it goes on forever. Palms line both sides of the hole – so the shots are clearly defined. Large bunkers in the landing areas will keep you honest and could be penal if you’re a little off from tee to green. The fifteenth and sixteenth holes are back-to-back par threes, yet another layout feature that you don’t see very often. Coming home on the par five 18th hole, a good birdie opportunity to end your round. Finally, the long and challenging seventeenth hole can be played as a par four or par five. If you choose the latter option, you’re driving through a very narrow chute of palms – with echoes of the 18th hole at Augusta National! As you would expect from the above description, the course is very walkable. 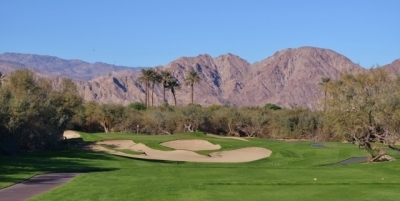 Ebersberger says about 20% of the club’s play is walkers – a very high percentage in the desert, though probably not too many give it a try in the summer (speed carts are provided free of charge for walkers). One note – because of the club’s fast play policy, they will keep you moving. Because there are no tee times, it’s essential to keep pace at the Palms – and dawdlers will quickly draw attention from the staff, along with a gentle nudge to move it along. But that’s a good thing. Playing fast is a benefit in today’s all-too-methodical golf world, and for members who get to know and enjoy the course on a regular basis – speed of play is an essential part of joining the Palms. Not a bad place to spend some time in the desert, and easy to see why so many locals have considered the Palms a hidden gem over the years. Membership information: Consult the website for more information on the club and call regarding membership possibilities.